You are here: Home / A-Blog / Turkish Court Orders Andrew Brunson Released After Four Witnesses Recant Testimony. Brunson’ case touched off a bitter diplomatic dispute between the U.S. and Turkey. The Trump administration pushed its Nato ally to release Brunson, arguing that the charges against him were bogus. Turkish President Recep Tayyip Erdogan rejected those requests, saying publicly that he was using Brunson as a bargaining chip to force the U.S. to extradite Gulen, who is living in exile in Pennsylvania. 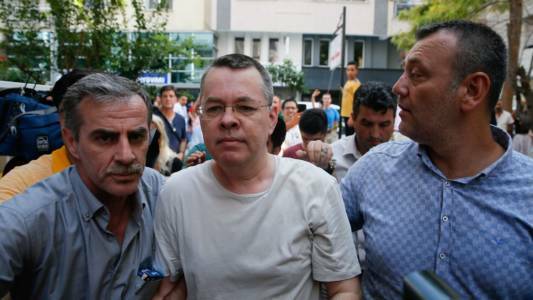 The Trump administration believed back in July that it had secured Brunson’s release following negotiations with Turkish counterparts. President Trump reportedly thought he had struck a deal with Erdogan by securing the release of a Turkish woman from an Israeli jail. But the Turkish court trying Brunson merely ordered him removed from jail and placed under house arrest. Friday’s hearing was the fourth for Brunson this year.